While they may not make for an entire meal, boba pearls are one of my favorite additions to tea, smoothies, or the beverage of your choice. 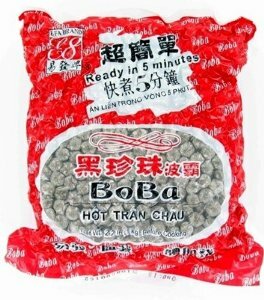 Most recognizable as those little chewy brown things in your bubble tea, boba are made of tapioca (a plant-based starch). I buy this brand from my local Asian food market. It's a few bucks cheaper there than on Amazon, but $7 for over 2 pounds is a decent price, and will last you a long time (I make just 1/4 cup for a serving). Speaking of servings, only make what is going to be consumed in the next day, because it gets weird/hard if it sits too long. Even freshly made to 8 hours later shows a significant difference in the chewiness. To start, bring some water to boil in a pot. Make sure your pot of choice gives them space to swim around (you don't want a big clump of boba, you want individual and delicious pearls). Once you have a strong rolling boil, add your dry boba and give it a stir. The boba should float as they cook for the next 10 minutes. Remove the pot from the heat, add a lid, and let it sit for 10 minutes. Finally, strain the boba into a bowl. From here you can vary the recipe, as long as you follow two basic guidelines- 1, you need to cover the boba with liquid, and 2, you probably want to sweeten the boba (it's pretty flavorless on its own). I add enough coconut water to just cover the pearls, and add a teaspoon of Truvia. I think the more traditional preparation is cold water and brown sugar, but I don't see why you can't experiment. Let your pearls cool and they're ready to be used! The first time I made boba in Durham (pictured above) D and I were going for a walk, and when he took a sip to try it for the first time he literally spit it into a bush. I foisted a batch on my father when he visited last, and while he wasn't so rude as to spit them out, I don't think he was a fan either. So, to each his own I suppose, but I think it's like having little round gummy bears at the bottom of your drink...which may make you more or less interested. Tell ya what. Come visit and I'll make you some, then you decide whether to make your own!